Special herbal skincare for impure skin uses knowledge from centuries-old German phytotherapy, with proven effects of plant species in the fight against impure skin. Gentle, cold-soaked vegetable oils are added to the smoothness of the skin, but they are so dark that they do not clog pores: jojoba oil, wheat germ, rich source of vitamin E, avocado oil and carrot oil. 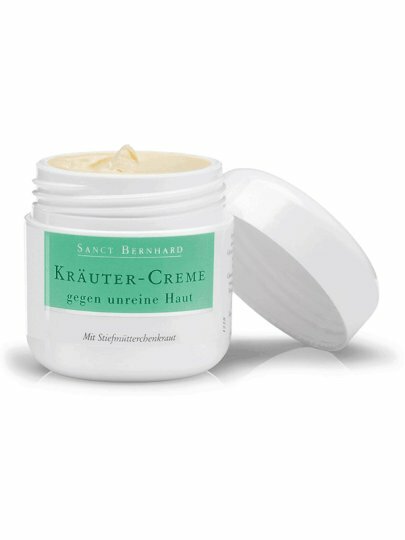 This herbal cream also improves skin circulation, an important factor that is often forgotten when solving the problem of impure skin. Aqua, Hydroxyoctacosanyl Hydroxystearate, Glyceryl Stearate, PEG-20 Glyceryl Stearate, Pentylene Glycol, Caprylic / Capric Triglyceride, Mel, Cera Alba, Persea Gratissima Oil (Avocado Oil), Simmondsia Chinensis Seed Oil, Propylene Glycol, Zea Mays Germ Oil (corn germ oil), Viola Tricolor Extract, Salvia Officinalis Leaf Extract, Chamomilla Recutita Flower Extract, Betula Alba Leaf Extract, Arctium Lappa Root Extract, Arnica Montana Flower Extract, Urtica Dioica Leaf Extract, Equisetum Arvense Extract, Allantoin, Triticum Vulgare Germ Extract, Triticum Vulgare Bran Extract, Triticum Vulgare Germ Oil, Helianthus Annuus Seed Oil , Panthenol, Beta Carotene, Tocopherol, Retinyl Palmitate, Citric Acid, Sodium Lactate, Glycine, Fructose, Urea, Lactic Acid, Glycine Soya Oil, Daucus Carota Sativa Root Extract, Al cohol denat., Phenethyl Alcohol, Sodium PCA, Inositol, Niacinamide, Phenoxyethanol, Sodium Benzoate, Benzoic Acid, Dehydroacetic Acid, Parfum. Apply morning and evening to well-cleansed face and neck skin.